The following legal documents constitute a mere sampling of the hundreds of letters of support from colleagues and patients that poured in to Federal Judge Moskowitz in behalf of Philippe Sauvage at the time of his historic Extradition hearing, which represents the most significant religious freedom case in recent American history. These letters which include personal testimonies from His Royal Highness Henri the Sixth Bourbon-Parme (the legitimate heir to the French crown), the Count Hubert de Mirleau and Francoise Dior (daughter of Christian Dior whose luxury products are known worldwide), leaders of the Catholic Traditionalists in France, as well as the most courageous leaders of the Breton Liberation Movement for whom Sauvage represented, as the heir to its historical lineage and the highest link to the Gorsedd to which the Prince of Wales also belongs, the very symbol of Celtic Spirituality. The files and audiotapes of Philippe Sauvage's historic religious freedom case are being protected and preserved in the Catharsis archives. I know very well Philippe Sauvage, whom I have met several times. I have shared with him extremely high levels of conversations in the realms of philosophy, religion and science. I have been particularly fascinated by Philip Sauvage's knowledge in the fields of Medicine and Health which deserves the greatest attention. In France, the Medical Board is extremely conservative and customarily denies any credit to non-conventional treatments. Doctors of Osteopathy, although perfectly recognized and appreciated in the United States, are still outlawed in France. Among those unconventional methods one should not ignore those proven to have an "ancestral healing gift" capable of relieving so many people from sickness, throughout the centuries, a domain being particularly well-documented in the Breton culture. To me, Philip Sauvage is undoubtedly one of those. His Gift and his Wisdom come from his ancestral heritage. I personally vouch for his moral qualities. I make these statements with the strongest emphasis, knowing personally that Philip Sauvage always displayed the highest standards of ethics when dealing with his clients and with their medical cares. I feel incumbent upon myself to reestablish the truth on Philip Sauvage in the name of Justice. We, Hubert and Francoise de Mirleau, solemnly testify that we both vouch for Philip Savage's morality. The two of us have personally experienced with extreme benefit his "healing" skills which are as genuine as they are potent. He is a very religious person who only knows to give to others without ever thinking of himself. Because he also took care of some of our relatives, we know for certain that he is able to cure illnesses that medicine deems incurable. We know that he is an authentic and outstanding "healer." May our testimony help him in his legal defense. I hereby acknowledge with great solemnity that I actually took in charge many patients who had been directed toward my cares by Philip Sauvage, whom I met (years ago) while we were both participating in a radio show organized by the official department of Surgery insurance. In parallel with his own cares, Philip Sauvage always ordered his consultants to subject themselves to an official medical control. As far as I am entitled to give an opinion on such an issue, all Philip Sauvage's patients were extremely satisfied with his cares. Although I am not entirely aware of all the details of the conspiracy against Philip Sauvage, I feel very sympathetic inasmuch as we, official doctors practicing holistic medicine, are constantly the victims of such machinations. Therefore, I am cruelly aware of all the harmful aftermaths created by an organized defamatory press campaign. For all that, you can really count on my compassionate solidarity. I am honored to inform you of the following facts. I am a journalist, an author and the Director of "Radio Courtesy" (the official Catholic Traditionalist Radio station in France). I know Philip Sauvage very well, with whom, indeed, I interacted on a professional basis. I discovered, then, a person not only highly religious, but also showing the highest scientific ethical standards. I have read, myself, many of his scientific protocols organized around the double-blind experimental methodology and, throughout his many interviews on my radio program. Philip Sauvage has always strongly emphasized such criteria. Coincidentally, during this same period of time, I became extremely sick, running a high fever with dangerous encephalic complications, which reached an unbearable threshold. Ignorant of my terrible health condition, Philip Sauvage came one night to my house and despite the gravity of my disease, I wanted to meet with him, if only to excuse myself. Being made aware of my health situation, Philip Sauvage immediately offered me his help. I had then nothing to lose, and I was also extremely intrigued by his skills, therefore, I accepted his cares. I was totally bewildered when I realized that less than five minutes after he had helped me, I was back to perfect health. NO fever at all. No more encephalic pains, etc. Since then, I never experienced any health problems. I insist that this testimony vouch for the truly exceptional moral standards, which Philip Sauvage displayed throughout our relationship. I always emphasize the fact that real Health is a Gift from our maker which men foolishly endeavor to compromise by the use of drugs, alcohol, anti-natural lifestyles and moral depravation. I am personally grateful to Philip Sauvage, not only because he saved me from a hopeless health condition but, above all, because he has raised my own human consciousness up to a greater awareness of the whole sacredness of Life. I know for a fact, due to my own personal journalistic investigations that Philip Sauvage has been the innocent victim of a true persecution established on political and philosophical motives. This persecution has arisen from Philip Sauvage's extraordinary impact on public opinion through television and I have certain proof that such a conspiracy was set up by government agents of the Marxist political police. I want this testimony to be used for his legal defense. I accept all legal consequences for my own statements, which I have very deliberately made. For many months I have been working on an explosive book about the conspiracy against Philip Sauvage. I have been directing an ongoing broad investigation of the alleged charges against the French TV, their guest the Prophet Philip and the people of his organization. I have interviewed in person many of Philip Sauvage's collaborators. My entire investigation and the proof I have gathered all point in one single direction: The whole issue represents a terrible and disgusting political conspiracy organized by the political police of the French Marxist government in concert with media manipulation of unprecedented proportion. It is clear that the French Marxist government has used the Prophet Philip Sauvage to attack at the same time the only non-governmental TV station and their journalists. I know for a fact that without this political agenda, they would not have tried to organize such a conspiracy against Philip Sauvage. I have personally investigated most protagonists in this conspiracy, including innumerable "patients" completely "cured" by Philip Sauvage, and I am absolutely convinced of his integrity and that of all his collaborators. I have in my possession many protocols on the procedure used by Philip Sauvage in his own practice. I know that his ethical standards toward medicine have been always perfect and that Philip Sauvage's entire operation was exclusively religious in origin. I want to emphasize strongly the fact that I have known Philip Sauvage for many years and that I have always been highly impressed with the intensity of his religiosity as well as the extent of his scientific knowledge. His expertise in the field of biology and paleontology is extraordinary and I, myself, had the privilege to read his dissertation on evolution. I also remember perfectly well how much the environment and all sorts of endangered species were constantly at the very core of his thinking and his worries. I know that if Philip Sauvage was given the chance to be judged in a non-hostile legal environment his innocence should be immediately recognized. Unfortunately, in the corrupt French system where many Ministers, including the former Prime Minister, have been indicted in the AIDS contaminated blood scandal, Philip Sauvage would not stand a chance. France is no longer a real democracy and I would be indeed concerned for his very physical survival. All these statements are established from facts coming from my own investigation and I am ready to bear full responsibility for my findings. Since I have learned of the extradition case against Philip Sauvage by the French government, I feel it is incumbent upon me, as my duty, to warn you of the dangers that he will be subjected to in the terrible event that the American Justice would comply with the French demands. I have known Mr. Sauvage for many years due to his involvement in the defense of our Celtic cause, as well as in the defense of all European minorities, and particularly due to his struggle within the Breton autonomist movement. I have personally witnessed and even participated in each of the baptisms of his children in accordance with the rituals of our ancient Celtic religion. As a member of the Gorsedd of Armorican Druidism to which his Majesty, the Prince of Wales, also belongs, I solemnly testify that Mr. Philip Sauvage is being persecuted purely for political reasons. Since the French revolution of 1789, all successive French governments only worsened their centralist totalitarianism. Since then, the ongoing French persecutions never ceased, from the physical elimination (genocide) of the Vendeans who refused to give up their Faith and their Identity to the firing squad of the illegal Communist courts of 1945 which killed or imprisoned thousands of Breton patriots deprived of all legal and civil rights due to revolting and preposterous trumped-up charges. Along with Greece and Rumania, France is the last totalitarian country in Europe with regard to her minority populations. France has refused to sign the "European Agreement on Linguistic Minorities" and has always fanatically persecuted her national minorities by denying even their very existence. France makes it illegal to speak our language and denies us any political rights, even while all other European countries are valuing more and more federalism. I want you to be really convinced that due to his outspoken free-speech and his great courage, Mr. Sauvage was considered a true danger by such a "Jacobinist," totalitarian and clearly tyrannical country. They want to neutralize him, since, for our nation, he is the ultimate keeper and defender of an immemorial Clan of Sacred Healers of our ancient Celtic Religion. Just as the Roman conquerors were murdering our "Druids" and destroying our holy forests, likewise he is being persecuted by their French offspring. I know the vile contempt demonstrated by France toward all human rights, and although she signed in 1948 the "Universal Declaration of the Rights of Man," France keeps torturing Breton patriots and Corsican patriots in the current prisons of the "French Revolution." Therefore, if peradventure, the American Justice would gruesomely deport Mr. Philip Sauvage to France, I could not hide my terrible concern. For all that, I beg you to do everything you can to rescue such a courageous man and honorable man from the "injustice system:" of French tyranny. I would like you to know that Philip Sauvage has been able to Heal me, overnight (and at a distance), from a terrible painful disease (shingles), when this affliction (if curable) is, as a medically demonstrated fact, always extremely long before it diminishes. My grandson, who formerly was suffering from severe epilepsy, has also been healed by Philip Sauvage's cares. Philip Sauvage has been the victim of an unheard-of defamatory press campaign. The political police dared to come directly to my home in order for me to sue him, and since I was denying their lies and claiming Philip Sauvage's true Healing results, they dared to mock me and endeavored to convince me otherwise. However, I persevered and am still proclaiming that I actually have been healed, thanks to his Gift, by Philip Sauvage. I want my testimony to be used for his defense. In October of 1988, Bernard was the victim of a terrible agricultural accident – he had been run over by a tractor. His cervical vertebrae were broken. He was totally paralyzed, but his brain was intact. He remained nine months in the hospital and one year in a rehabilitation clinic where he was trained to utilize his electric wheelchair before being sent back home in July of 1990. However, in October 1990, the health condition of my nephew suddenly collapsed: One of his lungs no longer functioned and the X-rays documented that his diaphragm was paralyzed. His condition then worsened: His blood pressure was extremely low and he entered into a deep coma. At this very time, I was informed of the existence of the Healing Practice of Philip Sauvage. I wrote to him and sent him a photograph of Bernard who, in the next following days, was to reach the ultimate hopeless terminal phase. Therefore, I myself, telephoned to one of Philip Sauvage's collaborators and I begged him for Philip Sauvage's immediate intervention. Philip Sauvage, having accepted this "impossible rescuing," after his "remote treatment" the healing is bewildering and immediate: My nephew instantly came out of his coma. New X-ray examinations were immediately realized: His diaphragm was functioning again. The doctors were so puzzled by such an absolute impossibility that they then declared that they must have misinterpreted all the former examinations! I have resorted to Philip Sauvage's Divine Healing Gift on several occasions, and I have experienced a rapid improvement in my health condition, accompanied by an unquestionable spiritual upliftment as well. He was constantly proclaiming never to practice any kind of medicine, but only to pray for the remission of my sins, through which he could bring relief of my sufferings. He never interfered in any way with any possible medical treatment. I was absolutely aware and in full agreement with the goals to which he was aspiring: To fight any physical or spiritual suffering by returning to a more natural lifestyle, and therefore to protect Nature and the human, animal and vegetal endangered species who are still living in harmony with the Creative Work of the Maker. 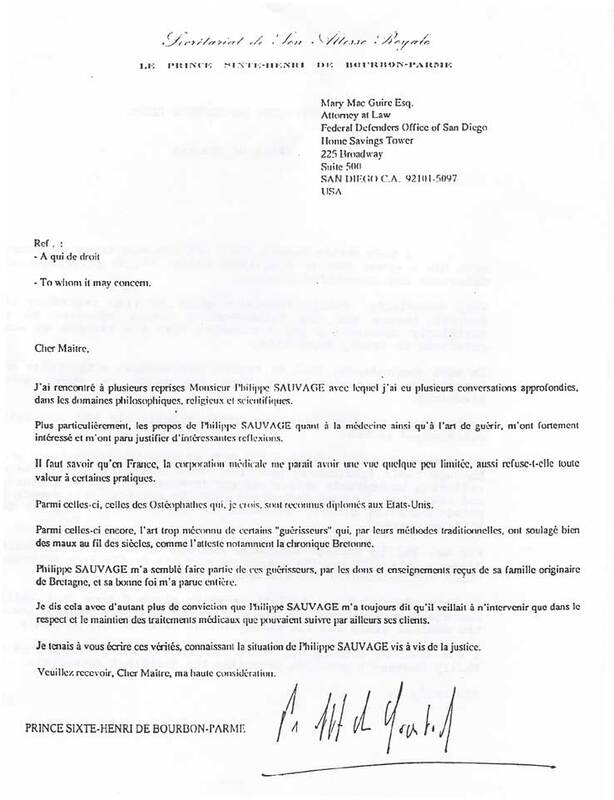 I proclaim with the highest possible conviction that Philip Sauvage is neither a fraud nor a dishonest person and I am willing to attest to this. In March of 1991, I applied for Philip Sauvage's cares on behalf of my eight year old goddaughter, stricken with mucoviscidosis (Cystic Fibromatosis), this being a truly incurable disease in rapid evolution for which the official medicine is currently incapable of providing any treatment. Through preliminary talks that I had with one of Philip Sauvage's collaborators, I was very clearly apprised of the fact that only symptoms of such a disease could thus be treated: Since Pamela was born with such a genetic trouble, it will remain in her heredity. I have also been told not to modify or to cancel in any way any medical cares. Philip Sauvage's intervention started on March 6, 1991, and at the beginning of April the first proofs of the Healing were already clearly visible. This poor little girl who, since here tenderest infancy has always been unable to sleep normally, was permitted to rest in a regular way. She gained so much strength that she was now capable of having a really normal day of true life, when formerly after school it was necessary for her to be carried by her mother and to be in her bed for the rest of the day. When formerly, she ought to remain indoors, sheltered from the sun and always subjected to intravenous perfusions, Pamela got the first true vacations of her whole life and was playing normally under the summer sun. Since the first intervention of Philip Sauvage, the improvement is constant and always bettering. She is now spending full days outdoors and she has never been sick again, even during the winter season. She no longer has the need to take any antibiotics as it was formerly the case and she is even absolutely indefatigable. Our greatest delight was to listen to this child herself claiming to everyone of her total healing, corroborated by all the bewildering medical checkups. Almost two years ago and in only two visits, Philip Sauvage has been able to heal my son, V. Carpentier. My son then was experiencing a terrible nervous breakdown related to his extreme drug (heroin) addiction. The results were bewildering and his healing was so absolute that today my son does not even smoke cigarettes. He is now living a happy normal life. I am extremely grateful. Only the results must matter, and Philip Sauvage's results are far beyond any further debate. I demand that this letter be produced in the defense of Philip Sauvage and I grant you my total gratefulness.